l that they need to know about India's current position. The book follows closely on the lines of a similar book entitled Reimagining Japan, which has also been put together by McKinsey & Company. Reimagining India: Unlocking The Potential of Asia's Next Superpower speaks of India as an economic power and compares it with China, which is also a nation that cannot go unnoticed as an emerging superpower. Many of India's most renowned entrepreneurs and leading firms have spoken up in this book. What really is our nation's capability in various areas? What must the nation do to unleash its true potential? This book aims to provide you with some valuable insight into those thought-provoking questions. 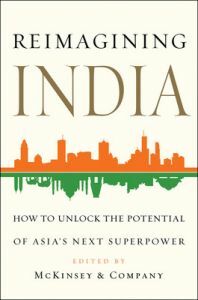 The book Reimagining India: Unlocking The Potential of Asia's Next Superpower has been published by Simon and Schuster, in the year 2013 and is available in hardcover. Key Features l This book has been authored by the world's leading management consultancy, McKinsey & Company. l The book deals with many complex topics that pertain to India's position as Asia's 'other superpower'. About the Author: Clay Chandler is the Asia editor for the global publishing division of McKinsey, while Adil Zainulbhai is McKinsey India's chairman, who has worked for the company for 34 years. Adil has given advice to several governments on a variety of social and development matters. McKinsey & Company is a renowned global management consultancy that helps many organizations deal with their problems, while being a reliable counselor to two-thirds of the popular list, Fortune 1000.